Caring for Aging Parents Puts Boomers in a Bind. Lots of families are dealing as best they can with the stress of running two households. Whether your parent lives with you, lives nearby or lives in another state, trying to juggle all these responsibilities is stressful, no matter how much support you have from family and friends. Medications are taken as prescribed. 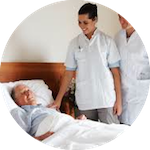 Home care agencies, if required, are carefully selected and result in good fit with your Elder’s needs and preferences for care. Services provided by home care agencies are monitored so your Elder feels at ease and continues to receive the best care. Appointments with Doctors take place in a way that satisfies your Elder’s interest in having their concerns heard and acknowledged, and they receive the care they prefer and deserve. Doctors’ orders for prescriptions are filled and directions for additional tests or appointments with other health providers are followed. A communication link between doctors and families is maintained to facilitate the exchange of detailed, accurate, and timely information regarding the Elder’s health issues and status.